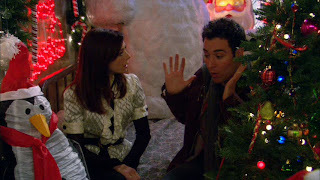 Back in Season 2 of How I Met Your Mother, we had to not only deal with Lily's return from San Fransisco after breaking up with Marshall, but also look back at what happened over the course of the summer she was gone. It all came to a head around Christmas when Lily heard an old voice mail from Ted in which he called her a "grinch"... or something. Another highlight from the episode? When Barney gets sick and uses the explanation "My nose was just overflowing with awesome and I had to get some of it out"